Vintage airplane rides over the Wine Country. 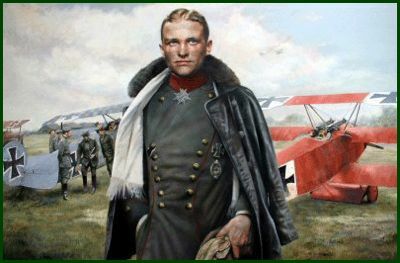 Ever imagined yourself as a WW1 flyer in an open cockpit, scanning the skies for the Flying Circus? Or zooming through the air in World War 2 fighter planes? 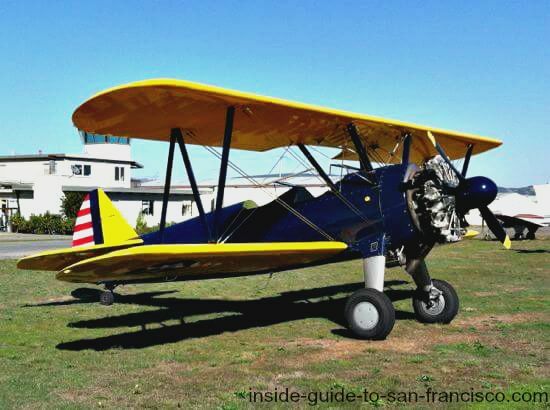 You can indulge your fantasies at the Vintage Aircraft Company, with biplane and fighter plane rides over the rolling landscape of the Sonoma and Napa Valleys. These Boeing Stearman PT17 biplanes were built in 1942 and were used to train pilots during the second world war. The flyers started on these planes, then graduated to the fighters used in actual combat, like the AT-6 Texan below. Take your pick- a biplane with French markings, or the Red Baron's bright red biplane. Or would you rather ride in a World War 2 fighter plane actually used in combat in the Pacific? The pilot of this aircraft shot down three Japanese fighter planes during the war. 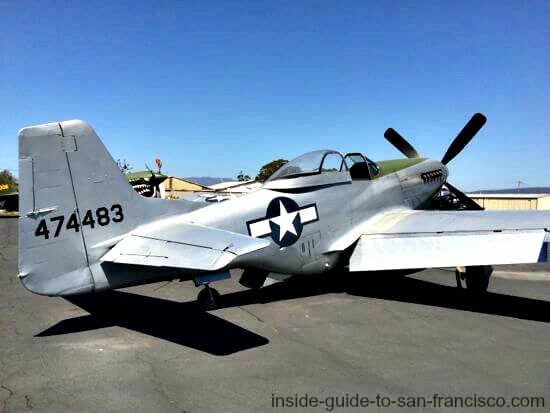 After its tour overseas, this Navy AT-6 Texan fighter was brought back and used as a trainer for fighter pilots during the remainder of WW2 (which is why is has two seats). 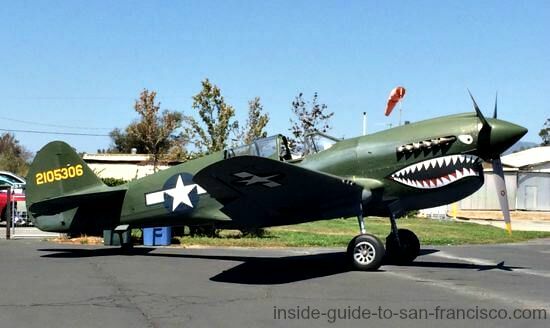 This Curtiss P40 Warhawk fighter plane, available for rides as well, was also used in combat, with the 49th Fighter Group in the South Pacific. They also have a P51 Mustang fighter available for rides. This one wasn't in combat, having been built later in the war. I went up in the "French" biplane and what an experience! The roar of the engine is intense and "windy" would be an understatement, but it's exhilarating to be flying in the open air, high above the fields and vineyards of the Sonoma countryside. The twenty minute flight took us a fair distance over the attractive wine country south of the airport. Some other people went up at the same time in the other biplane, so we could see the "Red Baron" off in the distance while we were in the air- an interesting sensation! Sonoma and Napa Valleys, up to St. Helena. Sonoma and west to the Pacific Ocean. 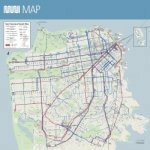 South to the Golden Gate Bridge, over Sausalito and Tiburon, and circling Mt. Tamalpais. 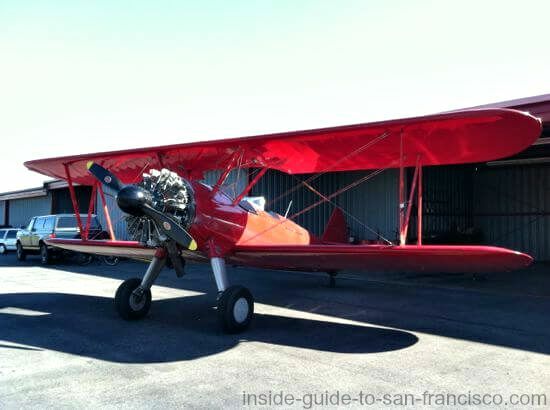 Each biplane holds 1 or 2 passengers who sit side-by-side on a bench seat in the front; the pilot sits behind. A little snug with two (32" across), but OK, depending on the size of the two passengers. You suit up with a khaki cloth "helmet" and goggles- the perfect retro look! The Navy fighter can cover the same areas as the biplanes, a bit more since its speed is a little faster. 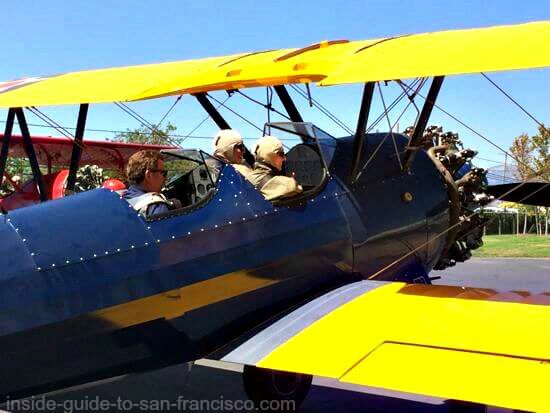 I haven't done this one yet, but it's on my list; imagine roaring over the Golden Gate Bridge in a World War 2 fighter plane! A once-in-a-lifetime experience. The fighter plane has two seats, one in front of the other, so it can only hold one passenger and the pilot. Are you a bit of a daredevil? If you request it, the pilot will do aerial acrobatics for you. The Loop, Barrel Roll, Hammer Head and a Cuban Eight. I'd have to ask the pilot what those last two are. I didn't try the stunt flying, but I was tempted! 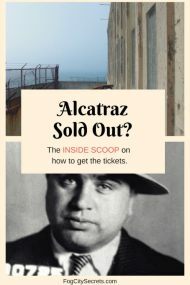 I did wonder about the safety of being hundreds of feet above the ground in a vintage airplane, but this company has been in operation for 30 years with no casualties. The pilots are two men in their 40's with decades of flying experience with these historic airplanes. The planes look well-kept and the pilots were very professional. The take-offs and landings were very smooth; I felt very safe during the ride. Saturday and Sunday: 10:30 am to 4 pm, drop in. No appointments necessary or taken. Open all year round, but no open cockpit flights in bad weather, or if the temperature is below 60 degrees F (13 Celsius). No age limit, but children need to be at least 48 inches (1.2 meters) for safety reasons. 20 minute flight: one passenger $175, second passenger $95. 40 minute flight: one passenger $295, second passenger $145. The P40 Kittyhawk: 20 minutes: $949. The P51 Mustang: 30 minutes: $1699. Discounts: 10% off for cash payments, also 15% off for military. 23982 Arnold Drive, Sonoma, CA 95476. 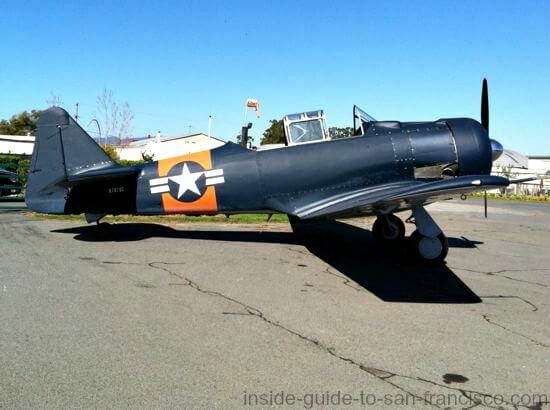 Vintage Aircraft is located on Highway 121 (Arnold Drive, locally) in Sonoma County, 6 miles north of Highway 37. It's about a 45 minute drive north of San Francisco. The countryside around here is some of the prettiest in the Bay Area. 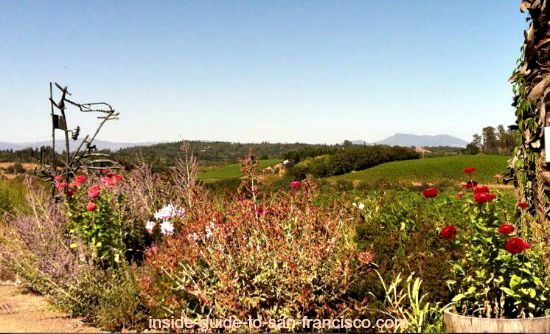 The photo below was taken at the Iron Horse Vineyards, a winery near Sebastopol. If you come up for an airplane flight, I suggest exploring some of the wineries in this area at the same time- maybe before the flight (just kidding).